Description: Oil has a soothing, uplifting, clean-smelling lemon scent. This plant is found in the West Indies and is very popular in Asia. It is a lemon-scented grass that contains many beneficial properties. It has traditionally been used to treat colds, headaches, stomachaches, and rheumatic pain. It contains natural vitamin A, an antioxidant that is great for the skin! 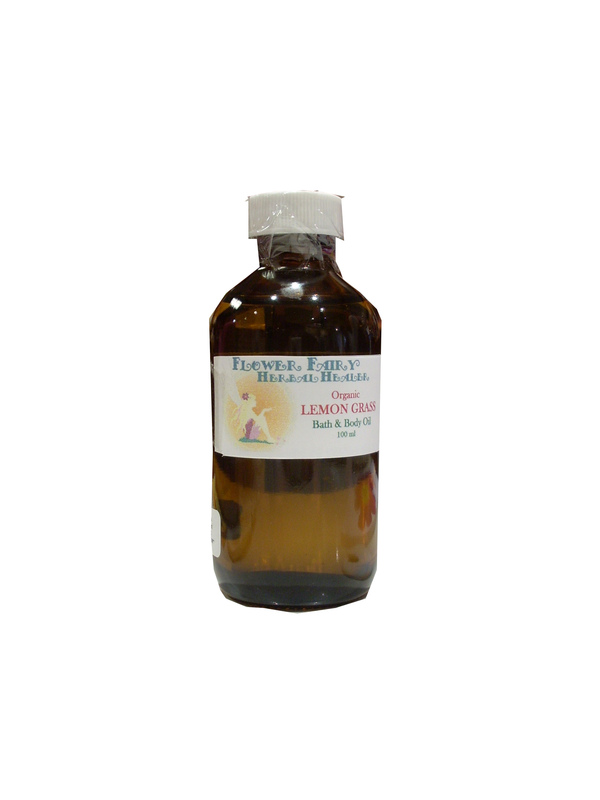 Its properties include sedative, analgesic (pain relief), anti-microbial and anti-viral, which make this oil an excellent soak for sore muscles or to use in cold season. This oil is also known to keep away bugs and to cleanse your aura of bad energy. Packaged in a high quality, beautiful beautiful cobalt blue/dark glass bottle to keep the product optimally therapeutic & safe of any plastic residue from plastic bottles. Directions: Use on skin to soften & gently scent & moisturize. Can be used as a bath & body oil or apply a small amount to damp skin after a shower. It is excellent therapeutic massage oil, used by many professional massage therapy clinics. It’s traditionally been used to treat colds, headache, stomach, rheumatic pain. Makes an excellent calming, soak for soar muscles or to use in cold season. Ingredients: Cold pressed sunflower seed oil base with 100% Certified Organic, Fair-Trade, Pure & Natural Essential Oilof lemon grass, 400 IU natural vitamin E oil, & jojoba oil. Packaged in a dark glass bottle.